Windows 10 Activator (KMS) !! Get a 100% working activator for your Windows 10 final version. I know you people are tired enough finding a working KMS. And today I've come with the latest version of KMSPico - 10.1.5 which is capable of activating both Windows and Office. About the Tool . . . 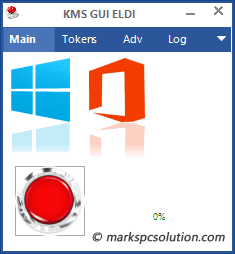 This KMS (ver 10.1.5) has been tested and verified by Marks PC Solution. And it works with both 32 bit and 64 bit Windows. I've personally tested this tool with Windows 10 Final (64 bit) and Office 2013 Professional Plus. Both of them are working fine! Double click on the file KMSPico 10.1.5.exe to start the installation. Find and run the KMS from your start menu or search it there. Now simply press the Red button to activate your system. That's it! For Windows, press Start + Pause key to open your system status. Then move to the bottom and check whether Windows is activated. For Office, open an MS word document > File > Account > Product Information > Check the Status. From the KMS window, move to the Tokens tab > Hit on the i button to check your activation status. Hope everything will work fine. Still if you face any problem, just knock me . . .
Our job is not to collapse Microsoft's business! If we do so, how do we find new tools from them? But they often act unfriendly. Charge too much price for new versions of Office and Windows. Sometimes original disks don't work multiple times. Even genuine buyers face troubles while activating the products. That's why I share these Key Managing tools (KMS) with the visitors. Brother...Suddenly today my excel shows unlicensed product..the excel sheets dont open...I tried to run the kmspico software ...i tried reinstalling it too...it says "this office15 office0365homepremr_grace edition beacause is 365 cant activate with kms, try different edition"
This is our latest activator. If this one fails, we're just sorry - you've to suffer. As soon as we get a better one, we will write about it. Worked perfectly with Office 2010 on Win 8.1. This guy is legit! Thanks Abdur. will it activate windows permanently? Windows Photos is Capable of Editing Images!! Get Photo Viewer Back in Windows 10 !! Built in PDF Printer in Windows 10 ! !